When it comes to buying a car you love, it isn’t hard to find one at Findlay North Volkswagen. 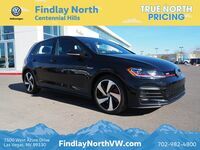 One of our most popular models is the 2016 Volkswagen Golf GTI here in Las Vegas NV, as it not only offers styling that will make you proud to drive down the Strip, but it’s a fun vehicle to take to the tracks. For those seeking a powerful option, it’s a smart choice that won’t hit heavy at your wallet or leave you with an impractical model. Fuel efficient, fun and offering plenty of cargo space, the Golf GTI is a great buy. If the Volkswagen Golf GTI has long been the car you’ve been keeping an eye on, you’re probably familiar with its style. Though the looks have changed over the years, it still retains a refined exterior that appears muscular without having to flex its muscles. The front end is where it most differs from the standard Golf, with a black honeycomb mesh grill and red accent, a matching honeycomb bumper and the slatted LED foglight design. An integrated rear spoiled and sport side skirts complete the look. Those who opt for the Golf GTI already know they’re looking at one of the most potent powertrain options in the lineup, surpassed only by the Golf R. The 2.0-liter turbo four has an output of 210 horsepower and 258 pound-feet of torque, with an optional Performance Package to boost horsepower. The big news for the 2016 model year is a new infotainment system, and the Golf GTI comes standard with the larger screen. This 6.5-inch capacitive touchscreen is not more attractive thanks to an increase in resolution, but Car-Net App-Connect features bring Apple CarPlay and Android Auto to the model. There are many sporty vehicles on the market, so why choose a hot hatch? The 2016 VW Golf GTI blends the benefits of a powerful engine with the practical features that make it a great daily driver. Cargo space sits at 22.8 cubic feet with the rear seats up and 52.7 cubic feet with the seats folded flat. There are plenty of vehicles on the market that now appeal to the style needs of motorists, but retain a low MSRP by keeping the same engine found in standard trim levels. The 2016 Volkswagen Golf GTI isn’t just a standard Golf with a fresh coat of paint, but has an entirely different engine that makes it a fun vehicle to own. The 2.0-liter engine offers 210 horsepower and 258 pound-feet of torque, plus a Performance Package is available to boost the horsepower up to 220 and adds larger vented disc brakes and a VAQ limited-slip differential lock. If performance is what you’re looking for, this package takes an already impressive vehicle and gives you even more control and stability. Not everyone is a rally racer, and you don’t need to be in order to enjoy driving the 2016 Volkswagen Golf GTI. In addition to having impressive cargo space, the vehicle is also a smart choice for those looking for an improvement in the interior. Classic Clark Plaid seats come standard, though a leather option is also available, providing comfort to the supportive sports seats. Other standard features include the 6.5-inch MIB II infotainment system, App-Connect functions, a USB port, Bluetooth with audio, a multi-function steering wheel, a rearview camera, driving mode selection and heated front seats. Do you think the 2016 Volkswagen Golf GTI might be the right model for you? Stop by Findlay North Volkswagen, serving the Henderson and Las Vegas, NV areas, to take it for a test drive.